Whole Year Averages of pupils participating in extra curricular sports clubs every week. 16% of the pupils involved each week were from the ‘previously inactive’ category, demonstrating our commitment to extra curricular sports provision. 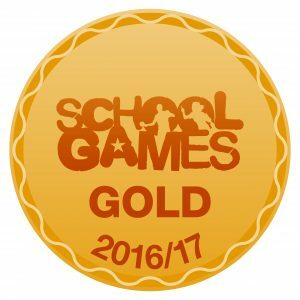 This Year we have maintained our GOLD Standard of Schools Games award. Our tracking of pupil participation has continued and we decided to break down the percentages into school terms. We were tracking to analyse the percentage of pupils who took part in sports clubs each week, over the course of the year. Whole Year Average: 56.6% of pupils participating in extra curricular sports clubs every week. Our levels of sports participation has been recognised by our achievement of the School Games Gold Mark! Our Aim for 2016-2017 – We are striving to increase the levels of participation further, as well as developing more opportunities for children to participate in competitive sport. We intend to enter more sports competitions than ever, inviting more children than ever to attend. During this academic year, we have been tracking the pupils participation and we are very pleased to have exceeded our target of 50% of the school taking part in a club. Our aim for 2015-2016: We are striving to improve participation further, and have set the ambitious challenge of having 50% of our pupils participating in extra curricular sport each week. At the end of the year, the school tracking showed that nearly 30% of the children were attending a club over the course of the year. Our Aim for 2014-2015: We would like that to be 50% attending each week, and we are striving to work towards this target.